Wretched subtitling on home-grown DVDs is one among many reasons to welcome the fine new Criterion release of Ray’s 1958 classic Jalsaghar (The Music Room), about a music-loving zamindar living his last days alone in his decrepit palace as the world changes around him. Another reason is the film’s tremendous visual and aural beauty, something I could fully appreciate only when I saw it on this restored print – much superior to the faded, scratch-ridden TV version that assailed my senses a few years ago. Right from the opening-credits shot of an ominously swaying chandelier (which will be an important part of the film’s mise-en-scene), Ray’s distinct visual sense and Subrata Mitra’s camerawork draw us into a world of grandeur lost and briefly regained. 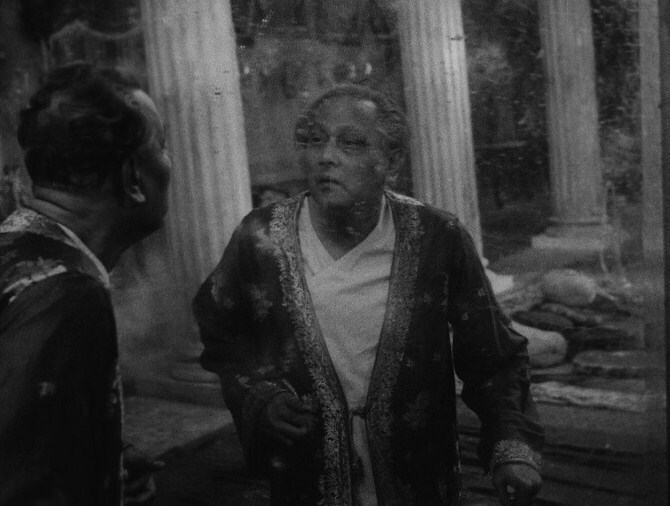 There are many exquisite shots, such as the one of the protagonist, Biswambhar Roy, gazing into an unpolished mirror, wiping the dust away with a puzzled expression, almost as if wondering if the great days of his past were an elaborate dream. Or the plaintive shot of him leaning on his stick, watching a lonely elephant in the distance. The new transfer makes these images vivid, perhaps bringing them close to the images Ray had in his head when he set about conceptualising the film. 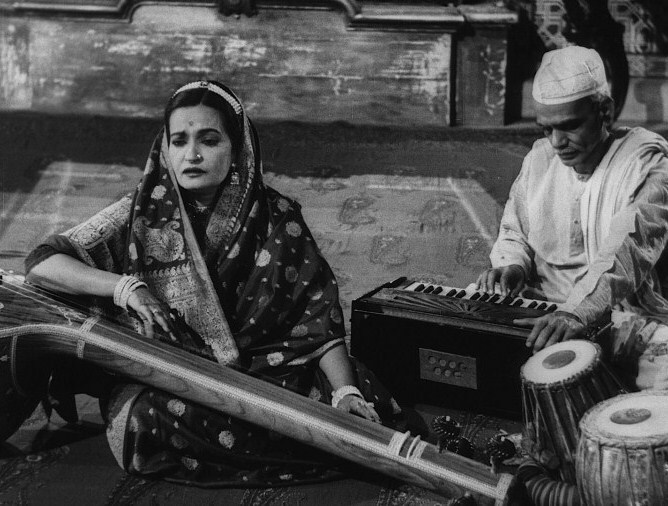 And the audio restoration is just as important, for Jalsaghar’s background score is by Ustad Vilayat Khan, and the film contains performances by such classical-music doyens as Begum Akhtar and Wahid Khan as well as a brief appearance by Bismillah Khan. A story about a magnificent, all-consuming obsession for music deserves nothing less. This is a film about hubris and decay - classic themes of great drama - and about a society in transition, but at a more intimate level it’s the story of an individual falling into madness. Ray’s attitude towards the feudal system was not an approving one, and you can’t imagine him being over-sympathetic towards his tragic lead character - in fact, he had some reservations about Vilayat Khan’s score because it seemed to romanticise the zamindar. But Biswambhar Roy isn’t merely a representation of an archaic, hyper-privileged way of life that is now crumbling into the sand like Ozymandias’s statue: he is also a melancholy old man who has lost his family, most of his possessions and his status, and who is watching the only world he ever knew becoming irrelevant. Whatever you think of the class he belongs to, you can’t help feel for him on some level, and Chhabi Biswas’s magnificent performance, along with the film's use of music (and our perception that this haughty landlord was a genuine patron of art and artistes) makes us emotionally ambivalent towards Roy. This friction propels the film. On one of the extras on the DVD package, director Mira Nair observes that given her own utter lack of interest in royalty, it’s remarkable how much she felt for the central character. I know what she means. But it’s clear that from the start, Ray intended Jalsaghar to be a film of visual flourishes. In an essay in Our Films, Their Films, he admitted that having won an award at Cannes shortly before making this movie, he allowed himself the indulgence of a crane for overhead shots (an accident with the bulky equipment would lead to the death of a coolie, causing Ray immense regret; clearly, he lacked Werner Herzog’s stoicism when it came to the casualties of filmmaking!). There are carefully composed shots which draw attention to themselves – the chandelier reflected in a glass, a spider scuttling across a portrait, a view of a stormy sky seen through the windows of the music room – as well as zooms and tracks that stress the contrast between the zamindar’s past glory and the delusions that now crowd his mind. One constantly gets the impression of a director trying to use the camera in inventive ways. Perhaps this might explain why Jalsaghar was a bit of a puzzle to its initial audiences (who had formed their own ideas about the “type” of director Ray was going to be) and why it took relatively long to be rediscovered and appreciated. But happily it’s here to stay now, and I think it’s close to the first rung of his work. I recently watched Visconti's Senso & Leopard, & both of those movies, dealing with fading minor royalty (Valli & Lancaster, respectively) & their calamitous dealings with the nouveau riche, reminded me a lot of Jalsaghar. Even Bertolucci's 1900 which isn't anywhere near the other 2 movies in craftmanship or impact (though it has both Valli & Lancaster in it :-)) has some elements of the high vs. the low, the padrone (De Niro) & the peasant (Depardieu). There are many other Western books & movies about upward & downward mobility (Magnificent Ambersons, Austen, Bronte etc.) which makes me wonder if that is one of the reasons Jalsaghar is one of Ray's best loved works in the US & Europe. Tipu: yes, the parallels with The Leopard are quite striking. This might sound strange to you, but I also think there are thematic similarities with Ford's The Man Who Shot Liberty Valance. The still-photograph-like opening shot of Chhabi Biswas reminds me a lot of John Wayne's final appearance in that film. Liberty Valance - you mean in terms of a man living on his reputation? Or of being helped by another person to save face? Interesting perspective. I wouldn't have thought of that. Its been some time since I saw Valance, so I don't recall the final shot. What does the movie loving Indian audience do? Pessimist Fool: not a ridiculous question at all, but I definitely prefer Ray - his storytelling is more fluid and much more visually interesting. Have mixed feelings about a lot of Benegal's work anyway. This wasn't Mitra's last film with Ray, by the way - he did many more, right up to Nayak. The problem of economically affordable DVDs still remains. indisch: for the longest time, my staple diet was the pirated Criterions I got from Palika Bazaar for Rs 200 or less. Have at least 50-60 of those "original copies". But now that I've developed an appetite for the originals - complete with proper packaging, booklets and all - it will be very difficult to go back! Oh it was Nayak. Somehow I like the first ten years of Benegal career more - he grew more complex with every film till Mandi...but yeah for the entire body of work, obviously Ray is miles ahead. On a funny note, I gifted Benegal's films like Bhumika, Junoon, Kalyug to some of my friends only to be cursed by them after they watched it. Is that a subtext that needs to be interpreted, as in, did the director really want the viewer to see it as a symbol of something? Could it have been just a studio prop, which served only a visually aesthetic purpose, as opposed to a thematic undercurrent? rantings: that postscript was mainly a joke - rest assured, I'm not really going to write a thesis comparing Michael Myers and Biswambhar Roy! (Maybe just a blog post when I'm very old.) But yes, in this case the chandelier - with its dimming candles and cobwebs - seems like a very deliberate symbol, given the prominent role it plays throughout the film. Really, really cheered by the idea of someone like Criterion restoring this movie - I've always been irritated by the sorry (print) state of our older movies. 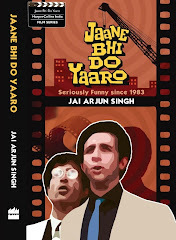 See the popularly available print of Sahib, Biwi Aur Ghulam as an example. Hoping more people take up this task. Tipu ,interestingly, Visconti and Ray made those movies at a similar point in their careers. Visconti's La Terra Trema,inter alia, was from the neo realist stable. And by the way,the themes explored even in Appu Trilogy are fairly common in World Cinema. 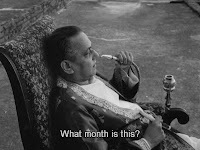 I think even in Pather Panchali the style of Ray is very assured and unmistakable. I will call it musical realism, just like in music a particular emotion is stressed at the expense of others, Ray did the same aided by the wonderful background score of Ravi Shankar. Though I would agree that it is perhaps not as "visual" a film as Jalsaghar. Jai , I have to disagree with the assertion that Ray was an "objective chronicler rather than a stylist". Rahul: well, yes, so do I. Hope you didn't think I was making any such assertion. All I said here is that it was possible for viewers to pigeonhole Ray as an "objective chronicler" after seeing his first two films. Not denying that there's a distinct style on view in Pather Panchali and Aparajito (especially when we see them now, already knowing about Ray's career). But in 1956 it was possible even for discerning cineastes to think that Ray was more a chronicler of social realities than a "cinematic" director (in the limited sense of that word). And Jalsaghar is definitely a more showy film than those two. I got my copy today. It is a delight to see it restored, with top notch video and audio. Another point I wanted to make is the patently false dichotomy that is posited by ``Objective Chronicler vs Stylist``. Consider Ozu , there is almost no panning movements in his camera and his movies seem plot less - so he can, by a certain common sense ,be said to be an objective chronicler - but he is one of the great stylists in cinema. I think there is an inherent polemic involved in the definition of objective chronicler when it comes to cinema, and its not easy to resolve it, and hence this posited dichotomy is not of much value. Yes, no argument with that. This is one reason why I've started using quote-marks around "cinematic", because more often than not the word refers to a superficial and limited idea of what type of filmmaking is "cinematic" and what isn't.